Painting the interior of your home or business should be a fantastically rewarding experience. You have the opportunity to redesign your living spaces or your commercial property for the better. The best way to make the most of the effort is to hire a professionally licensed painting contractor for the task. At RVA City Painters, our Richmond interior painting contractors are here to help you achieve all of your goals. Each time we are hired for an interior painting job, our residential and commercial painting contractors are honored by the trust that the local community shows in our skills and services. In order to honor that trust, our professionals seek to provide each and every one of our customers with the most customized services possible. We will bring this dedication to excellence to task for you. Call RVA City Painters today if you are planning an interior painting project for your Richmond home or business. Our courteous and polite staff would be happy to take your call. Our interior painters can answer any questions that you may have about our exceptional services. Interested in an estimate for interior painting in the Richmond area? We can schedule your appointment today! Throughout every stage of the effort, our painters will constantly stay attuned to your inputs. In this way, we can guarantee not only the high quality of our work but also that your interior painting project is as customized as possible. You and your family will be completely satisfied with the look and feel of your home or business for years to come. When you hire our painters for painting services in Richmond, you open up a number of fantastic design possibilities. 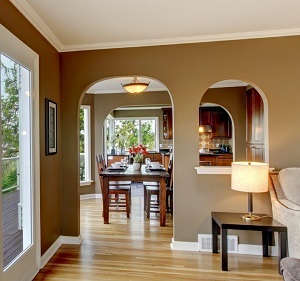 Our interior painting contractors have over 30 years of experience in the industry. As such, we will be able to perform the most delicate and intricate tasks for you. As such, not only are you assured the best possible results, but you are also not limited in the aesthetic effects that you can achieve. Our consultants can provide you with expert advice about materials, interior paint colors, patterns, and other painting options. Together, we can develop and execute the best plan for your home or business. If you would like an estimate for interior painting in Richmond, please call 804-557-4898 or complete our online request form.